A Brazilian Bouquet? I cant think of a better way to celebrate Spring’s first weekend than with a dozen season-changing favorites. If there was snow on your doorstep until recently, then you know that ‘spring’ is much more than a meteorological event. For those of us here in Chicago and for our listeners coast-to coast, Spring’s arrival includes a “free pass” to the sunshine season. Sign up for our weekly e-letter! And what better way to set the table for The Sunday Brazilian Brunch than with a ‘Brazilian Bouquet’ of season-changing favorites? It’s my hand-picked selection of breezy Brazilian jazz, budding musicians and more. And that’s better than Brazil has it today. Our spring is their autumn. Oh well. At least they have some of the world’s best music to help them along. So relax and revive with us on Sunday, and drop a quick ‘hello’ in the Chat Box. Youre always welcome! Click the ‘Play’ button at the bottom of your screen to Listen Live! Listen to The Sunday Brazilain Brunch. Three full hours beginning at 5 am, 9 am and 2 pm Central time every Sunday. Plenty of great music and a story or two. 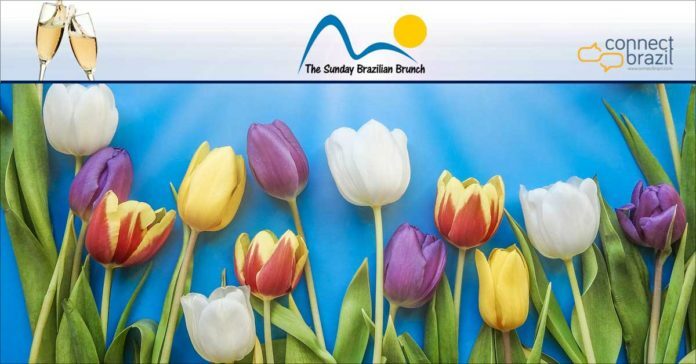 Or tune in for the Brazilian Brunch nightcap at 8 pm CT.
Join us on The Sunday Brazilian Brunch for ‘A Brazilian Bouquet’. Here’s a preview.